Wisdom teeth or third molar teeth are the last teeth to erupt into the mouth. There are normally four wisdom teeth, one at the back of each of the four corners of the mouth, behind the last adult tooth. Some people can develop less than four wisdom teeth and, occasionally, others can develop more than four. These would normally erupt between the ages of 18-24 years. 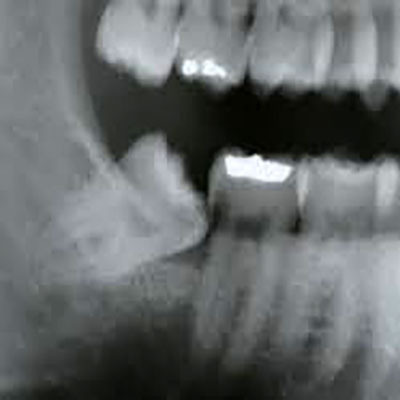 There needs to enough space for the wisdom tooth to erupt or get into the mouth. A wisdom tooth can fail to erupt properly into the mouth and can become stuck, either under the gum, or as it pushes through the gum – this is referred to as an impacted wisdom tooth. Sometimes the wisdom tooth will not become impacted and will erupt and function normally, if there is enough space in the mouth. Both impacted and non-impacted wisdom teeth can cause problems for people. Some of these problems can cause symptoms such as pain & swelling, however other wisdom teeth may have no symptoms at all but will still cause problems in the mouth. People often develop problems soon after their wisdom teeth erupt but others may not cause problems until later on in life. • Infection of the gum around the wisdom tooth (pericoronitis). This occurs in 50-60% of patients that we see and is the most common reason why wisdom teeth are removed. This type of infection can be severe and cause pain & swelling, however sometimes symptoms are mild. • Tooth decay (dental caries) can occur in the wisdom tooth or the tooth in front. We see this in 25-30% patients. This may not cause immediate problems until the tooth decay affects the nerve of the tooth, then an abscess can form. Toothache pain will be a feature of this. • Wisdom teeth can be affected by gum disease (periodontal disease) or contribute to gum disease on the tooth in front (5-10% of patients that we see). Patients may get no symptoms at all from this, but it can still cause problems. • Cyst formation around the wisdom tooth. All teeth form within a sack and occasionally this sack can expand like a balloon. This is called a cyst. Over time this can become larger and cause problems. We see this in less than 1% patients. These are the most common reasons why wisdom teeth may be removed. There are other reasons that are not listed and your surgeon will discuss these with you if required.